Key challenges in the taxation system stem from a complex web of supply and consumption, which differ from country to country, between goods and services, between business-to-business and business-to-customer commerce. As indirect tax is gaining importance, the complexity and scrutiny is also increasing. The SMEs, particularly, are having trouble understanding and adopting the necessary requirements to comply with the new system of indirect taxation. There are multiple compliance issues that are worrying the businesses, such as filing three returns in a month, registration rules, complex refund rules etc. So how do businesses prepare for such taxation related challenges? TaxGenie an application service provider based out of Mumbai has taken giant strides in order to rescue businesses struggling to cope with taxation policies. TaxGenie has leveraged Artificial Intelligence(AI), Machine Learning (ML), Process Automation, and Taxation knowledge to build a filing technology which makes GST compliance easy and simple, thereby helping businesses save a lot of time. TaxGenie’s GST compliance services help corporate and SMEs file GST return on time and claim maximum allowable input tax credit. A business delivering solutions,services or products may invoice its price to the customer, but it will have to include the tax that it collects on behalf of the government. The business will have to then pay back this tax to the government while filing liability. However, there are several inward purchases that the business makes for its services, for which the business itself pays the due tax to the seller. The seller collects this tax on his side on behalf of the government. This tax paid, subtracted from the tax the business collects from its consumers, is the net tax which it actually owes to the government. The challenge here is that there are not one,but multiple centralized & decentralized purchases, which often become difficult to track. TaxGenie works with such businesses to help identify all the input tax credit that could possibly be missing from their ledger, which would help in positively influencing their working capital. More over, not until the GST era, while filing their liability, businesses were just required to declare a macro account of their payables. However, things have changed now and every business is required to declare every single invoice generated. TaxGenie helps businesses to accurately track and identify every transaction. 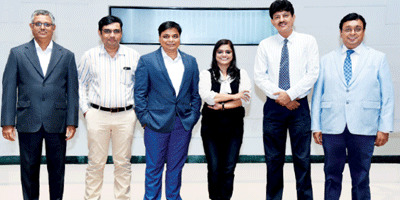 The company has built a technology solution that churns out all the data residing within the system of records like ERP (Enterprise Resource Planning) system, accounting etc. Secondly, it performs reconciliation with the vendors. Typical GST Reconciliation serves as a sieve to separate good inward invoices from the bad ones. Recon++, a special feature of TaxGenie solutions, is much more than that. It finds out all the reasons for mismatches, corrects them and does an in-depth analysis to prevent preventable mistakes incurred during collecting vendor details. Up-to-date Accounts Payable/Accounts Receivable, each vendor’s compliance history, clean transactional data, and clean master data in the ERP of any business, are few of the significant requisites from a CFO’s perspective. There is a lot at stake for the business if the GST compliance is not met. TaxGenie aspires to be a CFO’s one-stop-shop with regards to all compliance related dilemmas. TaxGenie was founded by Rakesh Dube, who is also the Managing Director for the company. Rakesh has worked for over 20 years in developed economies with Fortune 500/FTSE 100 clients via blue chip consulting firms. 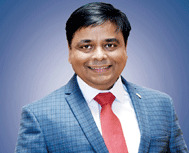 Rakesh has assembled top leadership team which has over 100 years of collective experience. TaxGenie is continuously learning from expert clients and CA Firms while simultaneously improving its digital solutions. A key adviser and early investor of TaxGenie, Afzal Modak, IIT Mumbai graduate, has worked for over 30 years in half a dozen countries and has also formerly served as a senior executive at GE. We asked Afzal why he was attracted to TaxGenie? He says, TaxGenie is a likeable business for three reasons (i) It is a data rich company, providing insights to clients by touching every business transaction,(ii) It is a noble cause, enhancing compliance and digitization of Indian commerce, and (iii) It is making taxation process easy for a broad range of businesses, from large corporates to small & medium enterprises. About ROI, Afzal says, "In India it is easier to build large companies, but margins are thin. We are focused on solving meaningful problems at scale. Hopefully profits will follow". In a very elucidative conversation, Rakesh explained the challenges and opportunities that have washed ashore with Goods and Services Tax(GST) which was introduced in July, 2017. The landscape of indirect taxes in India has changed entirely after the introduction of GST. It subsumed most of the existing indirect taxes, thereby simplifying the indirect tax structure. However, the massive change caused due to GST has its own set of challenges. GST has completely changed the way business transactions were traditionally managed. As mentioned earlier, each inward/outward invoice now requires a GST tax treatment. The financial statements should be docile with the GST records for seamless GST determination and e-filing. There is a lot of learning even for the most seasoned accounting and audit professionals. transactions, match data electronically, identify errors and carry out tax assessments effectively. Businesses have to therefore pull together their technological capabilities. Unfortunately, no single ERP(full-form) system available in the market today supports end-to-end GST recording and reporting requirements. Manual ‘workarounds’ or using spreadsheets is not a prudent business practice. It affects the quality of tax filings, thereby putting businesses at the risk of under/over paying, interest & penalties and could even lead to data loss in extreme cases. Hence, in addition to making suitable changes to the ERP, most businesses have to rely on ‘BOLT ON’ technologies that are better equipped to fulfill GST requirements. GST filing presents challenges arising from huge number of transactions, the frequency, number & complexity of GST reports, and the unfavorable consequences of non-compliance. The law and rules are still evolving, leaving a lot of ambiguity in dealing with tax treatment of transactions and reporting. GST non-compliance is not an option. Increased control from tax authorities, lack of time & resources, increasingly complex supply chains combined with increasing IT dependence have made a GST monitoring system a must for every business today. As a company’s responsibility does not end on filing GST returns but rather begins there. Senior management needs to have a periodical assurance that the GST liabilities are met correctly. At the same time, they need to identify gaps, if any, in processes, people and systems so that these gaps can be filled timely. Businesses also have to be in a state of preparedness for GST annual return and audit. Rather than delaying things, it is ideal to have on-going control in place to ensure accurate and seamless compliance. While GST compliances are cumbersome in nature, they also offer an opportunity to convert GST data into valuable business information to derive insights and identify hidden opportunities like using working capital more efficiently, getting insight into the supply chain based on actual transactions, identifying improvement opportunities in the supply chain process and Non-tax opportunities, like double paid invoices etc. TaxGenie’s Tax Intelligence Platform (TIP) is an integrated suite of indirect tax technology which consists of analytical tools, framework, methodologies and insights. These features allow organizations to gain quantitative insights and visibility into the status of compliance, process efficiencies and opportunities thus driving real financial value for the tax department as well as the whole business. GIS solutions are designed keeping in mind the challenges and opportunities presented by GST. The solution is built on the certified AWS Cloud platform, and leverages other essential technologies, such as machine learning and predictive capabilities which enable scalable, real-time data analysis, visualization and mining. Experienced tax analytics advisors in TaxGenie’s partner firms, combined with the powerful data and analytics methodology of GIS, can help businesses transform their tax data into insights. From uncovering risks in tax compliance to unlocking opportunities in transactional data, member firm professionals can not only help clients achieve global compliance, but also monitor accuracy, enhance working capital as well as create new enterprise value for the tax organization. A leading bank in Maharashtra with operations in Karnataka and 40 other branches, needed to improve their Core Banking System which did not offer a fully GST compliant feature. The major bottlenecks were that the CBS & peripheral systems were failing to identify GST liability, recognize ITC or generate tax invoices after bank charges for the services rendered and purchases made. TaxGenie offered a customized engine which helped in identification of GST liability, recognition of INPUT TAX CREDIT and invoice management. This solution consolidated raw inputs from CBS and other peripheral systems of income & expenditure, processed the data and generated invoice number as per defined logic. Moreover, consolidated raw inputs with invoice numbers, were revised and uploaded to TaxGenie's GST compliance platform for GSTR1 and GSTR3b return filing. As a result, over 25000 GSTR1 data is now being processed in under 15 minutes, after being uploaded to GSTN. Also, the tax invoices created outside the CBS are now sent to customers by email. Much deserved credit goes to TaxGenie and their revolutionary Tax Intelligence Platform! With such finesse and know how of the entire GST structure combined with technological expertise, TaxGenie has envisioned to make GST compliance a smooth process for tax payers, wherever they may be located.